Derry City manager Kenny Shiels has completed the signing of Israeli defender, Alon Netzer. KENNY Shiels has made a timely acquisition to his Derry City squad ahead of the 2017 Airtricity Premier Division opener against Bohemians after completing the signing of Israeli defender, Alon Netzer tonight. The Candy Stripes confirmed the addition of the 23 year-old centre half following tonight’s 3-1 victory over Dergview at Maginn Park - the club’s final pre-season fixture before Friday night’s opening day clash against Bohemians. Netzer is likely to conclude Shiels’ transfer business ahead of Wednesday’s League of Ireland deadline and joins fellow new signings, Mark Timlin, Eric Grimes, Nicky Low and Mikhail Kennedy in the 2017 City squad. And while Shiels was boosted by the return to action of experienced centre half, Aaron Barry who played the opening 45 minutes of tonight’s friendly against the Co. Tyrone outfit, the Derry boss was keen to bring in additional defensive cover for the upcoming campaign. Netzer, who was born in Herzliya, near Tel Aviv, made 54 appearances for Israeli club Ramat HaSharon before joining Romanian Liga 1 outfit, ASA Targu Mures in 2016. While it’s unlikely Barry will be match fit to start Friday’s game at Dalymount Park, Netzer’s arrival means Shiels has several defensive options with Ryan McBride, Scott Whiteside, Sam Todd, Conor McDermott, Dean Jarvis to select from. It was great to see Aaron and Ryan McBride both playing together again. It’s their first game together since last July and it’s great to have Aaron’s experience back in defence. “We’re pleased to get him because we were low (in options) at the back. We’re covered in practically every position now. It’s another addition and I’ve been working hard on this. It hasn’t just happened it’s taken a little while and he’s a good footballer - a left side centre back and he brings healthy competition to the back four. Meanwhile a first half strike from Rory Patterson and second half goals from Timlin and Josh Daniels was enough to give City a 3-1 win over Dergview at the Buncrana venue as the Candy Stripes wrapped up their pre-season campaign. Ivan Sproule had replied for the visitors to peg Derry back to 2-1 with seven minutes to go before Daniels made certain of the win in stoppage time. Shiels was delighted to see his tried and trusted central defensive partnership, Barry and McBride reunited at the heart of the City defence but admitted it was unlikely the Arklow man, who underwent successful surgery on his hip at the end of the 2016 season, would start Friday’s match in Dublin. 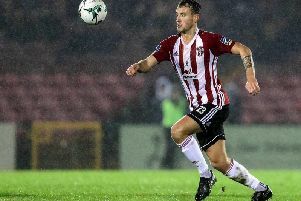 “It was great to see Aaron and Ryan McBride both playing together again,” admitted Shiels. “It’s their first game together since last July and it’s great to have Aaron’s experience back in defence.